Beijing, July 21 (IANS) Indian Foreign Minister Sushma Swaraj lied to Parliament that all countries back New Delhi over the border dispute, a Chinese daily said on Friday, and warned India to be ready for war and lose even its own territory if it did not pull back troops. A hard-hitting commentary in the Global Times said India had tested China’s patience, whose next move would be war if New Delhi did not withdraw troops from Doklam on the Sikkim section of the Sino-Indian border. The daily, run by the Communist Party of China, also said it was “comical” to compare India’s military with China’s. India will roll over if war happens, it said. The Times said the live-fire drill in Tibet by the Chinese Army and movement of huge military supplies to the region was not for “show”. 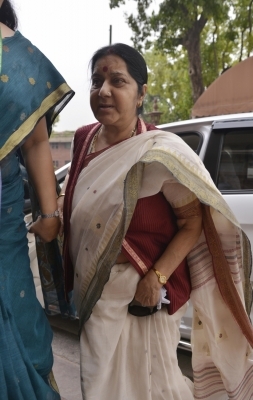 “She was lying to the parliament,” the commentary said, referring to Sushma Swaraj. “First, India’s invasion of Chinese territory is a plain fact. New Delhi’s impetuous action stuns the international community. No other country will support India’s aggression. “Second, India’s military strength is far behind that of China. If the conflict between China and India escalates to the intensity where their row has to be resolved through military means, India will surely lose,” the article said. On Thursday, Sushma Swaraj said Indian troops will withdraw from Doklam if the Chinese do the same. She said India was well-prepared to tackle any eventuality. The state-run Global Times is carrying op-eds and editorial calling for war every other day. “We notice that India’s stance has recently changed subtly and started to stress that Doklam is ‘a tri-junction area of China, India and Bhutan’ and attempts to call for ‘both sides to withdraw troops’ to allow for talks. “These changes show New Delhi’s guilty conscience. “China has reiterated its stance on the issue and shown the utmost tolerance and patience toward India. If Indian troops continue trespassing into China’s territory, what Beijing may do next is to get prepared for a military confrontation against New Delhi and resolve the conflict through non-diplomatic means. “India should have heard about the news that the People’s Liberation Army (PLA) has deployed troops near the China-India border and transported materials and supplies to the area. The PLA is also reportedly conducting drills for mountain operations. These are certainly not for show. Now that the PLA has moved in on the China-India border, they will definitely not call back troops unless they recover the Chinese territory. “China cannot afford to ‘lose an inch’ of territory. This is the sacred wish and request of the Chinese people. The Chinese government will not breach the fundamental will of the people and the PLA will not let the Chinese people down. “If New Delhi remains stubborn, India should get prepared for all possibilities from a potentially grave escalation of tension. “The PLA’s mobility and logistics capability cannot be matched by that of its Indian counterpart. PLA troops may appear in any area beyond the Line of Actual Control that was previously controlled by India. The China-India border area may become a stage where China showcases the achievement of its long-term military development and reforms. “The way some Indians compare China’s military strength with that of India at the border is extremely comical. “They bragged that India has more troops in the area but they fail to realize that the PLA’s strong capability to deploy troops can reverse the balance of power at the border within a day. The PLA’s long-range combat capability can also allow its troops in remote areas to provide fire support to troops at the border. “China’s military spending is four times that of India where its GDP volume is five times that of India. The great gap will shape the actual pattern of power balance between the two countries at the border. “Back in 1962, India underestimated China’s resolution to safeguard its territory. We hope India won’t repeat this mistake. “India should by no means count on support from the US and Japan because their support is illusory. If India fancies the idea that it has a strategic card to play in the Indian Ocean, it could not be even more naive. China does hold a lot of cards and can hit India’s Achilles’ heel, but India has no leverage at all to have a strategic showdown with China.